Update: API functions have now been introduced into arpReach. Details are in the download area. The closest thing to an API is the remote access url. To trigger this URL you will someone to program a cURL request to post the url in the background. Also, you will need to post the contact record to a link, or grab it on a form submission using http post. There is no documentation on how to do all of that which is why I talked to Michael (icoder.com) and then hired a programmer of my own. Depending on the complexity of what you want, it should be $200-$400 to complete an integration using the remote access url. It would be really nice is the arpreach guys posted in this forum every once in a while, at least acknowledging their customers are posting comments and feedback too. I would be willing to pay $9.95 per month just to have more interaction with the developers, and have more leverage in what updates get implemented. I don't think you can actually ADD a subscriber to your list via an ACTION. It looks like subscribers can only be added through "Posting HTTP Data". Using Contacts / Actions, you can create any number of actions and call them from within your own code. - add the member to your arpreach contact list. - tag the new contact as "member". - send the new contact a welcome email. - add the new contact to the "members" autoresponder sequence. - add the new contact to the "members" contact category. Adding the new contact is as simple as getting your code to issue an http post to a subscription form as is already described in detail (with an example) in the "Posting HTTP Data" section of the arpReach user guideavailable from the hub. - get the access key from Setup / System Settings / System / Integration. - the email address is the email address of the contact to be fed into the action. - actions is a comma-separated list of action id numbers that you want to call. The actions list in Contacts / Actions has a column containing the ID numbers that can be used here. From that one simple call from within your software, you can make arpReach run the 4 required actions on the new contact, and it's securely protected by the access key (which you can change at any time). Brandon, you're right. The contact needs to be already in the database for the remote call to work. 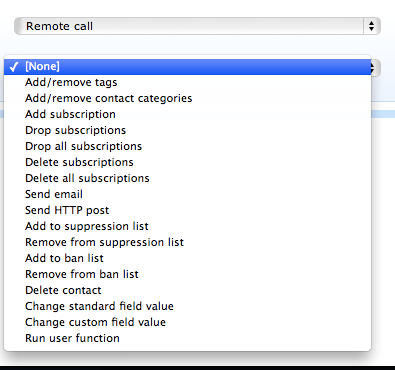 I forgot, because I had a custom script programmed to submit a form (adding the contact to the list) and then perform the remote call all with 1 click. It is working great for me. Both free and paid memberships. Welcome Steve, with this workaround you don't need the api for DAP. It works with the latest version of DAP as well. Hope you don't mind me digging up this old thread, but in case anyone else is looking for documentation on the API, I suggest downloading the latest documentation from the arpreach hub. They seem to have added it now.